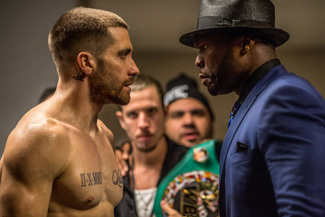 Viewed without scrutiny, there’s not much wrong with Southpaw, the boxing drama from Antoine Fuqua. The direction is strong; a handful of the performances are compelling. It’s very well shot. And it has the kind of familiar dramatic narrative that easily captures eyes and partial attention on cable television. With a careful reading, however, Southpaw emerges as one of the most troubling, twisted narratives presented as part of a mainstream movie in years. Insidious sexism, the glorification of violence, the denial of trauma — all are here, and all are shocking. Billy Hope (Jake Gyllenhaal) is atop the boxing world, with an undefeated record and a beautiful wife, Maureen (Rachel McAdams) at ringside. When an up-and-comer gets under his skin at a charity event, Billy triggers a brawl that ends in gunfire; Maureen is killed. Rather than focus on the well-being of his young daughter, Leila (Oona Laurence), Billy shuts himself off from the world until he’s broke, suspended from prize fighting and friendless. Oh, and Leila is taken by child services. For damn good reasons. We are meant to see Billy’s journey back to the ring and self-sufficiency, under the tutelage of aging coach Tick Wills (Forest Whitaker), as redemption and revenge; he must learn to control his anger to survive in the ring and get his daughter back, and the young fighter holding his belt (Miguel Gomez) just so happens to be the guy that trash-talked Billy into getting Maureen killed.